Currently, more than enough food is produced worldwide to feed everyone globally. Yet, 11 percent of the world’s population, roughly 815 million people, suffer from food insecurity or hunger, according to the U.N.
Closer to home, 17.6 percent, or nearly 433,000, people living in Miami-Dade County are not sure where their next meal will come from or how substantial it will be. 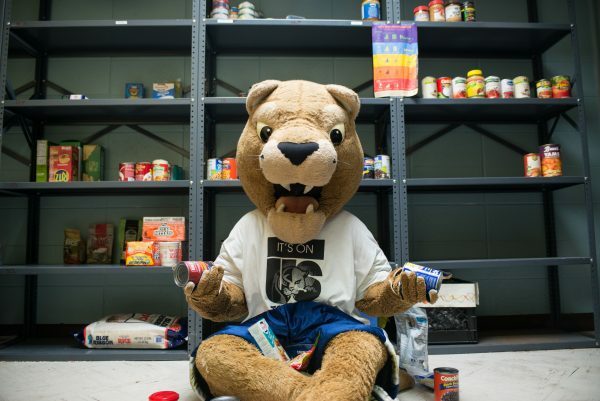 In an effort to help, the Student Dietetic Association (SDA) and the Association of Graduate Students in Dietetics and Nutrition (AGSDN) joined forces with the Dietetics & Nutrition Peer Mentors to launch a food drive at Stempel College that will help supply non-perishable items to the FIU Food Pantry before the busy holiday season. But the students are taking their efforts a step further, using their expertise in the field of dietetics and nutrition to provide tips for healthier eating. “When you do not know where your next meal will come from, you end up not being too concerned about following healthy habits. There’s an association between being food insecure and lower intakes of fruits and vegetables, which tend to be underrepresented in the diets of most college students,” said Alexander Gonzalez, SDA president and bachelor’s student in the department of dietetics and nutrition. Healthier food options tend to be more expensive in terms of cost, but for perishable items, there is also chance for waste. On the other hand, processed foods that are high in sugar and fat are usually less expensive and often become a first option. Another tip? The group recommends eating foods that are rich in fiber, which can help lower the risk of being diagnosed with Type 2 diabetes by 21 percent. “If we are able to promote at least one healthier eating habit, we believe we are moving in the right direction,” added Sader. To contribute to the Dietetics & Nutrition November Food Drive, please drop off non-perishable items to AHC5, room 317 between 8:30 a.m. – 5 p.m.